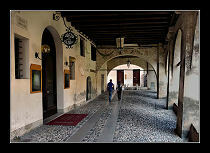 The porticoes and the "barbacani" (projecting part of a house supported by corbels and trusses. 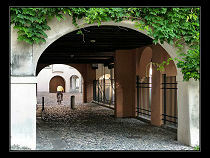 with no supporting columns underneath), are one of the principal characteristics of medieval Treviso . The porticoes date from 1164, the year in which Federico Barbarossa presented the Trevisan people with a special "diploma" which gave them the permission to build, amongst other things, brick houses with porticoes, in the main streets: "porticus in viis regalibus edificare". Seven hundred years later and this building design does not seem to have changed: even today, both inside and outside the 16th century walls, the morphology of these ancient 'barbacani" is imitated and houses with porticoes continue to be built. The historical centre of the town is a collage of porticoes: on the oldest, friezes, capitals, and heraldic bearings, tell the story of the city, while decorative ceramic tiles and frescoes embellish and enliven them. In the course of the centuries the porficoes have developed into varied forms: the heavy forms of the medieval constructions; those whose reflection lies in the waters; the pointed arches of the 4th and 5th centuries; the slender renaissance porticoes; narrow ones and those wider; the neogothic forms of the Liberty period; and the more severe and rigid forms of the modern period. These porticoes provide comforting shelter from the rain and the sun, and serve as an historical expression of the Trevisan custom of promenades and happy conversation.